On 2 January 2002, Crompton Greaves had a market cap of Rs 115 crore and its stock was at Rs 1.80. Today, on 19th July'15 the stock price is trading at Rs 198 and the company's market cap is Rs 12,397 crore. Crompton Greaves has given returns of 10900% in last 13 years. Rs 1 lakh invested Crompton Greaves in Jan 2002 is Rs. 1 Crore and 10 lakhs today with CAGR of 43.6% in last 13 years. Lets take another example of little known company Mayur Uniquoters which is our 8-Bagger stock. We recommended this stock 2 years back at price of Rs. 56 (adjusted price after 2 bonus issues and stock split in last 2 years, actual recommended price was Rs. 448) and today it’s at Rs. 411 giving absolute returns of 635%. You might be surprised to know that Mayur Uniquoter is a 136-Bagger stock for investors who invested in it 6 years back. Investment of Rs. 1 lakh in Mayur Uniquoters in Jan 2009 is valued at Rs. 1 Crores and 36 lakhs today. That's too excluding dividend payouts. Mind boggling, isn't it? It's a fact! Company has posted strong growth YoY and rewarded share holders in big way, Company was trading at Rs. 3 (bonus / split adjusted price) with market cap of merely 13 crores in Jan 2009, today market cap of the company is 1,902 crores. Saral Gyan team do take care of above concerns by doing in-depth research and analysis of small cap companies before releasing Hidden Gems research reports with buy recommendation. Its sincere efforts, dedication and passion of our equity analysts that 27 out of 40 Hidden Gems released by us during last 4 years have given more than 100% returns to our members. In fact 17 out of these 27 stocks have given returns in the range of 200% to 1900%. We are pleased to share with our readers that 4 Hidden Gems out of 12 released in 2014 have already achieved their target price giving more than 100% returns to our members in period of 6 to 12 months. Hidden Gems stocks - 2014 average returns as on date is 58.4% compared to small cap index returns of 29%, hence outperforming small cap index by 29.4%. 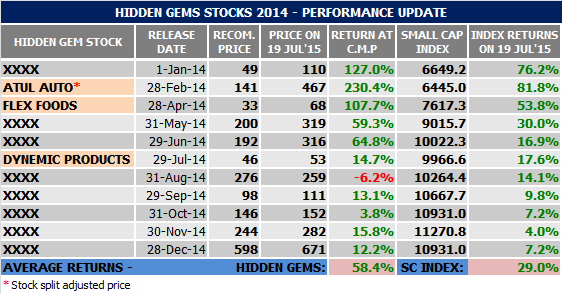 Similarly, if we look at performance of Hidden Gems stocks released in first 6 months of 2015, we are glad to share that our Hidden Gems continue to outperform small cap index by wide percentage points. Hidden Gems - 2015 as on date average returns is 20% compared to small cap index average returns of 4.6% since beginning of this year, outperforming small cap index by 15.4%. 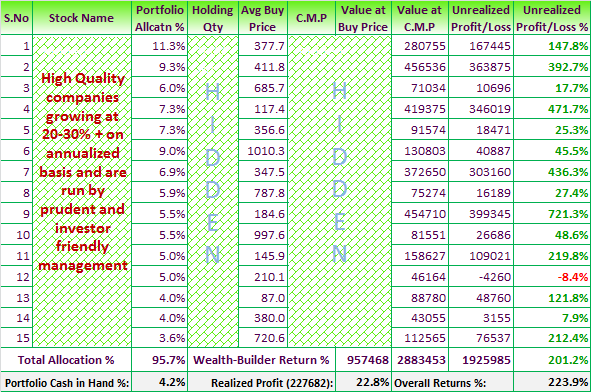 We also take this as an opportunity to share our Wealth-Builder portfolio returns. Under our Wealth-Builder service, we encourage our members to replicate our Wealth-Builder portfolio by investing in selective high quality small and mid cap companies. These companies are reporting 20-30% + annualized growth and got their due share of re-rating and delivered exceptional returns to our members so far. Since 1st Jan 2013, Nifty has given returns of 44.7%, Sensex returns is 45.4% where as Wealth-Builder portfolio has given returns of 224% returns to our members. In case you have not yet started building a portfolio of high quality and fundamentally strong growth stocks for long term wealth creation, please find below the Wealth-Builder portfolio allocation & performance update for your reference.